The Best Exotic Marigold Hotel (2011) is truly an ensemble piece, starring as it does no less than seven of Britain’s best-loved veteran thespians. Directed by John Madden, Starring Judi Dench, Maggie Smith, Tom Wilkinson, Bill Nighy et al. Their aged characters all decide to spend their twilight years in the hotel of the title, an emporium that when they arrive is clearly a mere shadow of their expectations. The scene is thus set for the seniors to confront not just the limitations of their accommodation, but also the limitations of their very lives. They are, of course, a mixed bunch; Judi Dench is newly-widowed, Maggie Smith a wheelchair-bound racist, Tom Wilkinson a High Court judge hoping to lay the ghost of a youthful relationship, Bill Nighy and Penelope Wilton a disillusioned couple, and so on. The plot, therefore, is relatively simple, deriving its complexities from the problems, issues and situations encountered by its characters, and achieving its pleasures from the resolution, or otherwise, of their predicaments. Unfortunately, the film is somewhat handicapped by cliché and stereotyping. Ol Parker’s screenplay is predictable from the beginning and characters are not so much formed as acting styles displayed: Dench is quintessential Dench, Smith is Smith, and Nighy, rather annoyingly, is Nighy (though he is given a rather splendid moment at the climax of his own character’s story). For me, the worst offender here was Dev Patel, as the hotel manager, giving a performance that provided an Indian caricature rather than character, almost to the point of insult. Noteworthy is Penelope Wilton, who rises above cipher level and gives the outstanding performance of the film. Cliche is not restricted to characterisation; Jaipur is presented from a simplistic, though admittedly colourful touristic viewpoint and serious themes are alluded to only cursorily; poverty, the caste system, arranged marriages. Nonetheless, one’s attention is more than held as the various story lines unravel, and there are funny and tender moments and some marvellous one-liners. The film’s feel-good factor is undeniable and it is very well made. It is also refreshing to see the film addressing an unusual target audience through its story, themes and casting, and it is difficult to resist its charm and clear good intentions. Although a better film would have probed its concerns with more depth and subtlety, and its audience would have felt its emotions less overtly managed, The Best Exotic Marigold Hotel has many pleasures and is well worth a look. 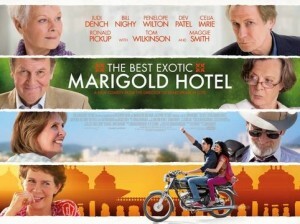 This entry was posted in Blog and tagged Best Exotic Marigold Hotel, Comedy, Film club, Review, Stereotypes. Bookmark the permalink.